DUBLIN - Results from Ireland's parliamentary election are due Friday with Prime Minister Bertie Ahern, one of Europe's longest-serving leaders, battling to win a third term. Polls closed late Thursday in what was billed as one of the tightest elections in years, though leading bookmaker Paddy Power reported a "torrent" of bets on the prime minister earlier this week. Ahern, one of Europe's longest-serving leaders, has overseen a prolonged economic boom over the last decade, and was also hoping for a boost from his role in the recent historic deal to restore self-rule in Northern Ireland. But signs of a cooling in the economy may have played in favour of main opposition leader Enda Kenny, as with allegations about Ahern's personal finances which have long dogged him. Some 466 candidates jostled for 165 seats in the Dail, Ireland's lower house of parliament in Thursday's vote. Counting was set to begin at 9:00 am (0800 GMT) on Friday, with results beginning to flow in from the afternoon. A knife-edge outcome, though, could mean the final result will not be known for several days. State broadcaster RTE said there were indications that turnout would be higher than in the 2002 election, when nearly 63 percent of Ireland's three million voters cast ballots. 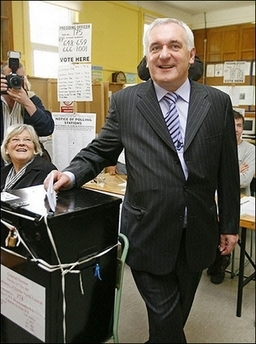 Ahern cast his vote in his Dublin Central constituency while Kenny and his wife Fionnula voted in Castlebar in his Mayo constituency in the west of the country. But even if it comes out on top, Ahern's centre-right Fianna Fail party could face having to find a new coalition partner, as it battles for power with Kenny's centre-left alliance of the Fine Gael-Labour parties. Ahern's party has been governing with the smaller, liberal Progressive Democrats, but their support has plummeted and Ahern may not be able to count on them in government. If neither of the big two blocs gets a majority under Ireland's proportional representation system, smaller parties like Sinn Fein - now in devolved government in Northern Ireland - and Greens or independents could hold the balance of power. Ahern this week reiterated, however, that he would not form a government with Sinn Fein, better known to many as the political wing of the Irish Republican Army (IRA) in the British province of Northern Ireland. Sinn Fein leader Gerry Adams, who has no vote in the Republic and is not standing for election despite leading his party's campaign, accompanied a party candidate voting in Dublin northeast. An opinion poll in the Irish Independent indicated there was a combined 41 percent for Ahern's Fianna Fail-Progressive Democrats outgoing coalition and 37 percent for Kenny's Fine Gael-Labour alliance. The election campaign, launched after President Mary McAleese dissolved the 29th Dail on April 29, took on the air of a presidential campaign, according to political observers. Pictures of Ahern, 55, and Kenny, 56, dominated posters on the country's lampposts. Both are amiable, populist leaders with similar styles and are more than comfortable glad-handing voters on the stump and at election hustings. With few big ideological differences between the two main coalition blocs, personality was seen as key throughout Ireland's 43 constituencies. Early campaigning was dominated by a complex row about Ahern's personal finances, including payments he received from businessmen and friends when he was finance minister in the early 1990s, and a house purchase in 1997 after his marriage broke up. As the campaign progressed, attention switched to the main issues of health, crime, house prices, transport and quality of life.